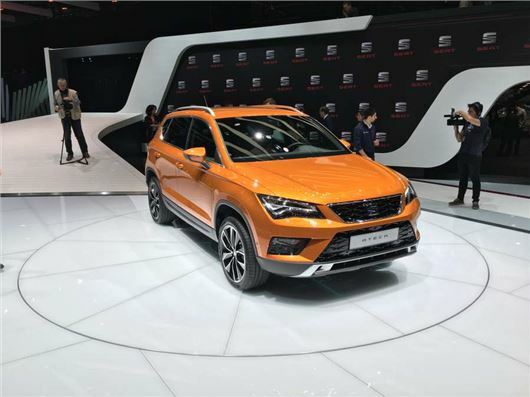 The Geneva Motor Show 2016 has played host to one of longest-anticipated crossovers of the past 10 years - the SEAT Ateca. It was unveiled at the Swiss show this morning, with prices starting at £17,990. SEAT also said that the specification for the Ateca will be revealed on 1 May 2016, with deliveries starting in September. It's been a long time coming, with plenty of teasers and concepts along the way, including the rakish 20V20 concept SUV that SEAT revealed at 2015’s Geneva Motor Show. The Ateca, which will share much with the forthcoming Yeti replacement, shrouds in sharp style what is fundamentally a bulky, practical crossover SUV. The SEAT Leon design cues are obvious throughout, with the pointy wing mirrors, grille, headlamps and side "blister" creases lifted directly from the hatchback. Inside, the cabin is virtually transplanted directly from the Leon, save for the addition of an electronic parking brake. But this is a very spacious crossover, with a huge amount of rear headroom and a boot that by volume trounces most in the class. With either 510 or 485 litres of space, depending on whether it’s front-wheel or four-wheel drive, the boot is significantly larger than the Nissan Qashqai’s 430 litre cargo area. Power comes from a predictable range of turbo petrol and diesel units – predictable bar one, that is, with a surprise entry point to the Ateca range being a 1.0-litre TSI petrol with 115PS. Elsewhere you’ve got a 1.4-litre TSI with 150PS, a 115PS 1.6-litre TDI and two 2.0-litre TDI diesels, of 150PS and 190PS. Front-wheel drive and a six-speed manual gearbox are standard, though four-wheel drive will, of course, be on the options list, as well as a DSG automatic gearbox. SEAT is pricing the Ateca aggressively and although unconfirmed, an £18,000 starting point is intimated, with the car undercutting most rivals like-for-like, in particular the segment Godfather, the Nissan Qashqai. Equipment will be generous throughout, with alloy wheels, touchscreen media, Bluetooth, an electronic parking brake and air conditioning all standard. Top-of-the-line Xcellence spec will include part-leather seats, parking sensors and full-LED headlights. Technology innovations (for SEAT, anyway) include a system that steers, accelerates and brakes the car in heavy traffic – one step away from autonomous driving, in effect.